A Red Team exercise is lotsa fun not only because you have a more realistic engagement due to the broader scope, but also because you can encounter situations which you normally wouldn’t on a regular narrow scoped penetration test. I’m going to focus on pageant which Slurpgeit recently encountered during one of these red team exercises which peeked my interest. Why does the user only have to type his ssh key in once? 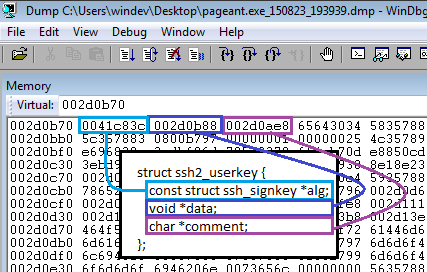 The pageant process keeps the decrypted key in memory so that you can use them without having to type the decryption password every time you want to use the key. From an attackers perspective it of course begs the question if you can steal these unencrypted keys? Assuming you are able to make a memory dump of the running process you should be able to get these decrypted ssh keys. During this blog post I’ll be focusing on how you could achieve this and the pitfalls I encountered when approaching this. [03:56:37] Dump 1 writing: Estimated dump file size is 84 MB. 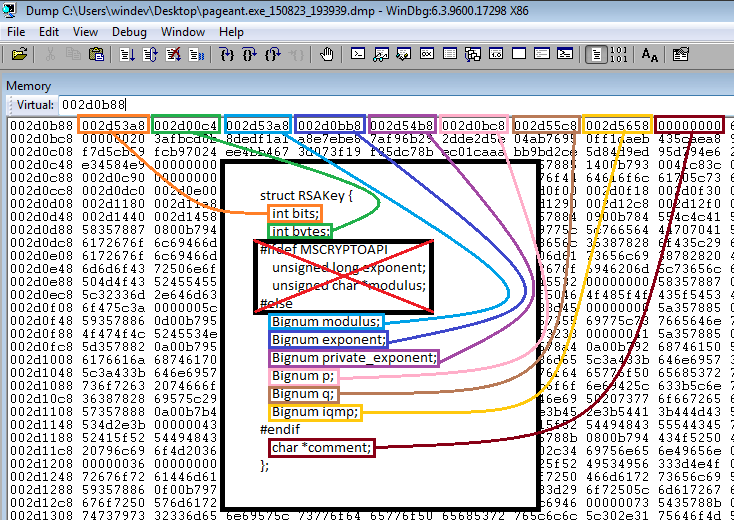 This should, as can be seen, create a full dump (‘.dmp’) file which you can then use for analysis. The full part (-ma) is important or you won’t be able to extract the juicy bits later on. If you are doing this during a red team exercise like Slurpgeit was doing, don’t forget to add the ‘-accepteula’ argument or your victim will have all kinds of popups. Another nice habit is to always(=as often as possible) make process memory dumps from processes and grabbing the binaries. You should of course be aware that this might cause the process to crash, but sometimes the risk is worth it. At first I thought this might have to do with possible fragmentation of the memory regions in the dump format, but after learning more about the format this wasn’t really the issue in my dump. I then decided that I needed to understand the minidump format, which to my surprise seems to be mostly documented by Microsoft. A good starting point to understand this format would be the blog post by @moyix, which provides a great library to parse the mindump format as well. This is where at first I got a little bit confused since I started to parse the wrong stream type. I choose to parse and investigate the ‘MemoryInfoListStream’ stream type since I assumed that would contain the raw memory regions that hold the juicy info. Turned out it didn’t contain the raw memory regions, it just contained a description of memory regions and their access rights etc. So after some fiddling around I finally found the ‘Memory64ListStream’ stream type which does contain the correct structures to access the raw memory regions I was after. The fun part is of course that after understanding all this it turned out that the dump file just contains all the raw memory regions appended to all the defined structures until the end of the file. All you need is the pointer to the start of these raw memory regions if all you wanted is access to the raw memory. Like we’ll see further down this blog post this is not wat we want, since we need to also find some specific offsets in these raw memory regions. Note that BaseRva is the overall base RVA for the memory list. To locate the data for a particular descriptor, start at BaseRva and increment by the size of a descriptor until you reach the descriptor. print "You need the minidump library"
print ":::Found raw memory data stream"
Now that we know the minidump format, let’s see if we can find those decrypted private keys in the process’s memory. We need to know how they are stored in the first place, how else are we otherwise going to search for them in the vast amount of raw memory bytes? Let’s have a look at the source code first, since after all pageant is open source (putty git). Now if you follow that ‘prompt_add_keyfile()’ function and then the ‘add_keyfile()’ function in it, you should eventually land on line 560 ‘skey = ssh2_load_userkey(filename, passphrase, &error);’ in the winpgnt.c file. Now that looks like what we are after, a function which takes our file and our passphrase and hopefully returns the decrypted key. That’s a big list of pointers to functions…again not really suitable to create a signature in my opinion. This is partially due to the fact that you’d have to check all pointers and see if they end up in executable code. Seems we have to dig into the structure of how the actual private key data is really stored instead of the meta-info structures. Searching for signatures isn’t really beautiful or error proof, why don’t you just access the structures like pageant itself does? It has to have a beginning somewhere to find all the keys. Hmm that didn’t sound bad at all, let’s see how pageant itself stores all the keys you load. One of the things that quickly becomes clear is that pageant has some functions with end with ‘234’ and if you look those up you’ll be reading through the ‘tree234.c‘ file. Can’t be any clearer, pageant is using a 2-3-4 tree for storage and retrieval of data. Yes, indeed, this is also the data structure used by pageant to store the key data. We know this because if we continue from the last line winpgnt.c:560 where ‘ssh2_load_userkey‘ was called and keep on reading to see what happens to the ‘skey’ variable we’ll end up at line winpgnt.c:687 which shows us ‘if (add234(ssh2keys, skey) != skey)‘. Now to verify that the ‘ssh2keys’ variable is indeed a 2-3-4 tree, we just search through the code and we’ll end up in the winmain function where we find ‘ssh2keys = newtree234(cmpkeys_ssh2);‘ confirming that indeed is a tree. Just as .text is the default section for code, the .data section is where your initialized data goes. This data consists of global and static variables that are initialized at compile time. It also includes string literals. The linker combines all the .data sections from the OBJ and LIB files into one .data section in the EXE. Local variables are located on a thread’s stack, and take no room in the .data or .bss sections. Now isn’t that nice? We actually have the starting point to the tree in which all the private key data is stored. From here we can parse the tree and extract the private key data, at least that’s the working theory. Let’s put it to the test. Luckily for us it seems that pageant doesn’t support ASLR so the 00420D2C offset is perfectly usable without any fiddling to start the journey towards finding the decrypted private keys in memory. Now that we have a starting offset we need a tool to interpret and navigate through the dump file that we have. For this we will be using WinDBG which is part of the Debugging Tools for Windows collection. Since I’m no windbg expert it’ll probably look clumsy, but for me it got the job done. Just load up the dump file into windbag using the File->Open Crash Dump option. Now that the dump file is loaded you can enable the memory view by pressing alt+5 just make it nice and big to work with, since this will be the only view we’ll be working with. I changed the view from ‘long hex’ to ‘ASCII’ and yes this is indeed the default comment as generated by puttygen. OK, now what? Even though with this cleaner method we have a good way to enumerate all the loaded private keys we still need to extract the actual data. As for that unfinished sentence about key data structures, seems we’ll have to dig into it after all. Like we can see the struct has a variable part which doesn’t seem to be used if you use the binary downloaded from the official website. One of the things that kept me busy for some time where the first two field “int bits & int bytes” their values in the memory dump didn’t seem to match any logical size for the key or the struct. It was not until I debugged a running pageant instance with ollydbg (I usually trust binaries more than the src, you never know what a compiler might have done) that I realised that they really didn’t seem to be used, although they are present in the struct. This seemed to be confirmed by the src which also doesn’t seem to have a reference to those fields being set. I might have still missed something, so please let me know if I did. * be dealt with outside it. Now that, that’s clear let’s have a look at turning this information into usable private keys which we can actually use to authenticate against servers. Heh, that sounds funny put into perspective like that. My first thought was to just produce a putty file again, we began our journey on Windows with pageant after all right? The format if you are wondering is described in the file ‘sshpubk.c‘ starting on line 378. At least with this format a lot of tools are able to work with it, which in the end run is just what we need if we want to use the keys to start plundering servers, sort of speak. This however is not something that you want to do manually, since it turns out that the base64 encoded data contains a DER (or BER) encoded ASN.1 structure. If you want to visualise this you can use this online ASN.1 decoder which accepts the base64 encoded form of the key and then generates a hierarchical structures side by side with the hex dump. Construct an RSA key object from a tuple of valid RSA components. Private exponent (d). Only required if the key is private. First factor of n (p). Optional. Second factor of n (q). Optional. CRT coefficient, (1/p) mod q (u). Optional. An RSA key object (_RSAobj). Like you can see I’ve been lazy and kept the windbg display format on a single line which for now works fine. With the exported private key you could now attempt to connect to any server on which this key is valid. On the left the key extracted from memory and imported into puttygen, like you can see it has no passphrase. On the right the original key that I imported into pageant, you might recognise the comment from earlier screenshots, when I started to write this blog post. So even though at first the memory dump of a process seems like a collection of gibberish there is a lot of information you can still find in it and access in a structured way, just like how volatility makes the big pile of computer memory dumps accessible in a structured way. Of course this exercise has been a lot easier due to the availability of pageant’s source code it’s still something that applies to a lot of processes / applications out there. For example the way that mimikatz is able to extract passwords from a LSASS process memory dump is such an example. If however for some reasons you are not able to access the information in a structured way you could always just search for the structure in which the information is kept. In this case after obtaining a clear picture of all the structures this would certainly have been possible. 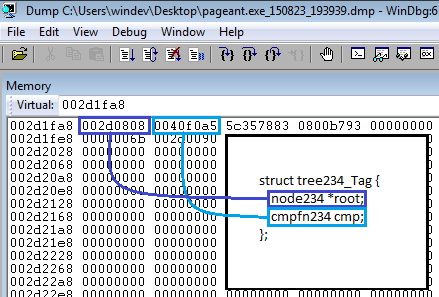 Like you can imagine there is a lot more to be extracted from the process memory dump of pageant since it contains two more interesting trees, one for other type of keys and one for short-term passwords. So if you want a nice exercise you should definitely play with it, since having the source code really is a big advantage. Hope you had as much fun reading this as I had writing it and learning a lot while doing so. Could you also describe it in more detail? It has been a while since I used this code. It might be that you are trying it on a new version of the memory dump format…. Hi, When I am trying to run the python code I get a ArrayError in constuct/Core.py. you now how to fix it?